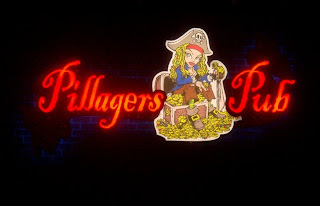 Update: Pillagers Pub closed Nov, 30, 2012. All of a sudden, this little neck of my neighborhood has an embarrassment of riches for the drinker, and particularly the beer drinker. Two of the greatest dive bars in this city, recently joined by (and pleasantly contrasted with) the hip Gainsbourg's, now share a block with two new beerlovers' destinations with Naked City and Pillager's pub, opened earlier this week. The latter looks a little hastily assembled, and the space is a bit too light and too obviously designed for a different sort of business. But Pillager's now gives us access to the brews of Baron Brewing and Three Skulls Ales, in addition to a small but nice menu of late night eats. This pub seems much more of an iffy business proposition than an instant neighborhood institution like Snoose Junction, but cheers and best wishes to small brewers bringing us something new.